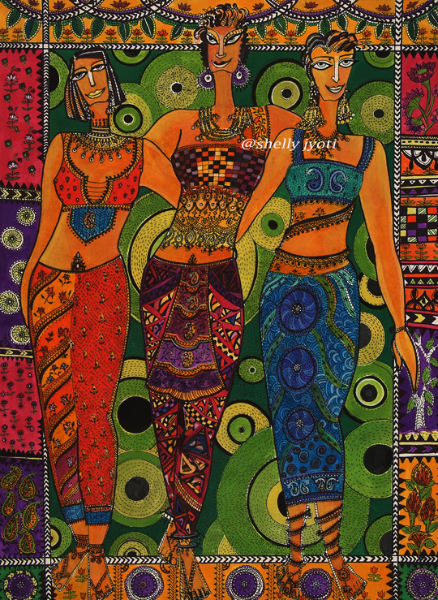 Woman Made Gallery is proud to introduce Shelly Jyoti, a contemporary artist from Baroda, India who also delves in traditional decorative art forms. She is an international exhibiting artist and her interdisciplinary work in garment design, painting and poetry writing has appeared in solo and group exhibitions within India, Singapore and North America. 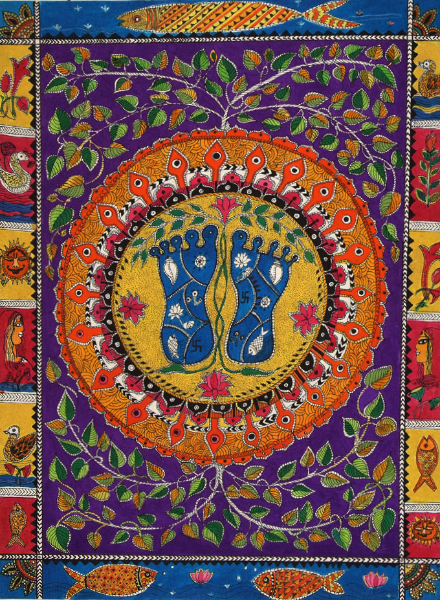 “My present body of work represents a fantasy of heritage: the patterns and confluence of traditional art forms and references to embroideries and embellishments from India. I like to explore and reinterpret indigenous decorative traditions within my art practice. 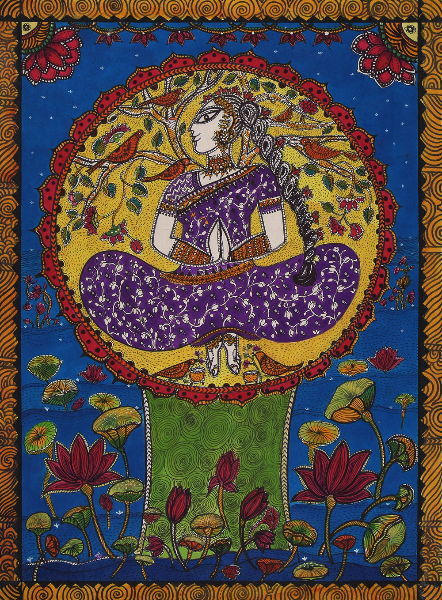 Please join us for an exploration into the imaginative and colorful world of artist and writer Shelly Jyoti, who will be present at the opening reception on February 29, 2008, from 6 to 9pm. 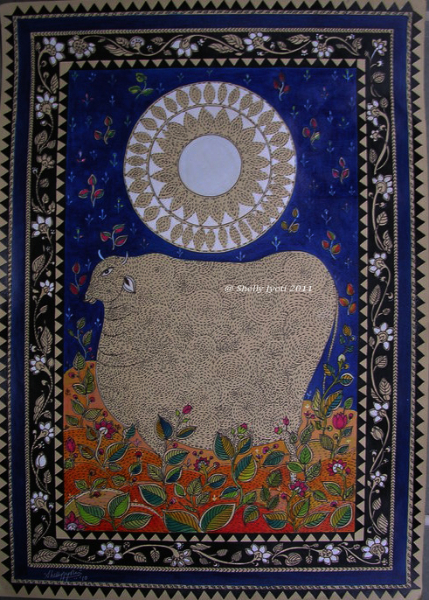 In addition to her solo show, with more than 15 paintings, Shelly Jyoti is offering insights into the inspiration for and creation of her art at a workshop on March 15th. Included will be a lecture, slide presentation and the creation of a piece of art. 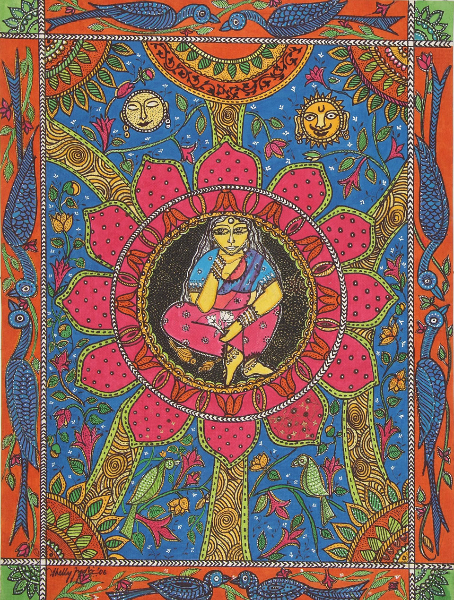 Workshop with Shelly Jyoti: Madhubani Art of “Mithila” March 15, 2008 / 10am–4pm / Fee: $90 for WMG members, $120 for non-members. All materials and refreshments are provided. Registration is necessary and space is limited. Woman Made Gallery is supported in part by grants from the Illinois Arts Council, a state agency; a CityArts Program II grant from the City of Chicago, Department of Cultural Affairs; the Chicago Community Foundation; the Gaylord and Dorothy Donnelley Foundation; the Hugh M. Hefner Foundation; the Efroymson Fund, a CICF Fund; a major anonymous donor; and the generosity of its members and contributors. “The past is not dead. In fact, it’s not even past” wrote William Faulkner. This is certainly true of India today, where we happily marry the traditions of our glorious past with the contemporary culture of today. We see it in the garba and bhangra even now being danced, but to disco beats. In fashion, we see that saris and ghagras are not abandoned but combined with noodle straps and corset cholis. 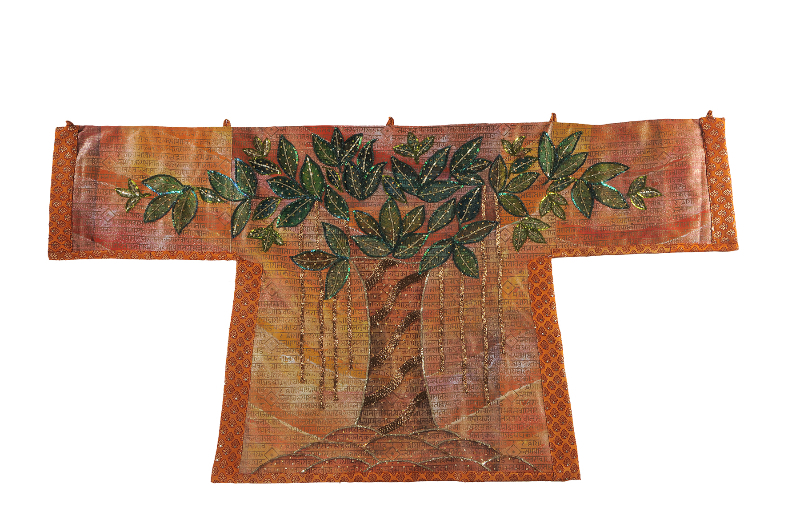 On the other hand, elaborate mirror work backless blouses are worn with jeans. In music we still have the sitar, table and santoor, now played with electronic instruments. Our mythological and religious stories are adapted to TV and film viewers. Religious celebrations like Eid, Holi, Ganpati and Diwali are done d with even more enthusiasm but in a modern way In the visual arts it is even stronger. 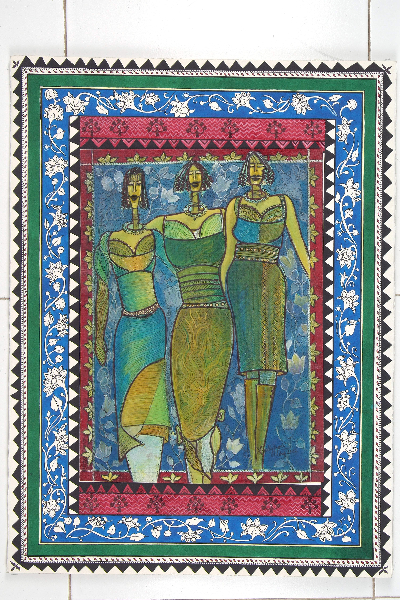 The old traditional forms reincarnated in the new contemporary avatar Several eminent artists like M.F.Husain , Nilima Sheikh , Arpana Caur and Jayasri Burman draw from the traditional art forms, mythological imagery and folk motifs to create them in a new media and genre . Shelly Jyoti is certainly one of these artists. 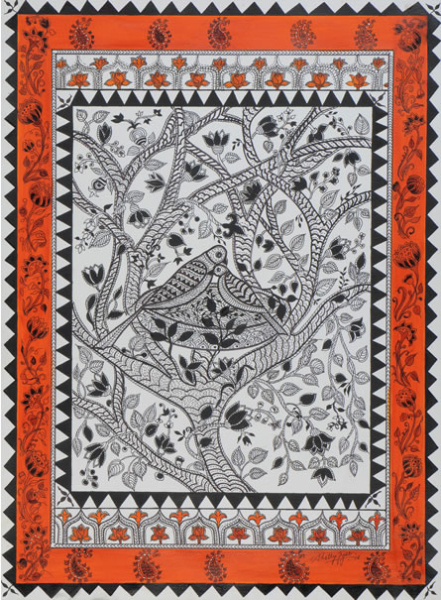 Exploring the decorative elements of the age-old Mithila art form and translating it into a modern idiom. 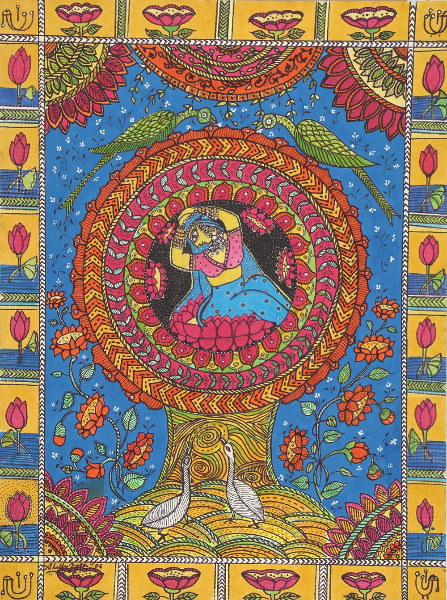 Mithila or Madhubani art is practiced in Bihar and was done exclusively by women, as it needed exactitude and patience. 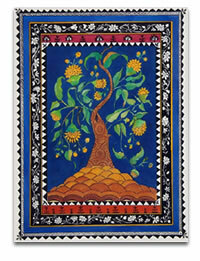 It is centred on mythological, folk and tantric themes. 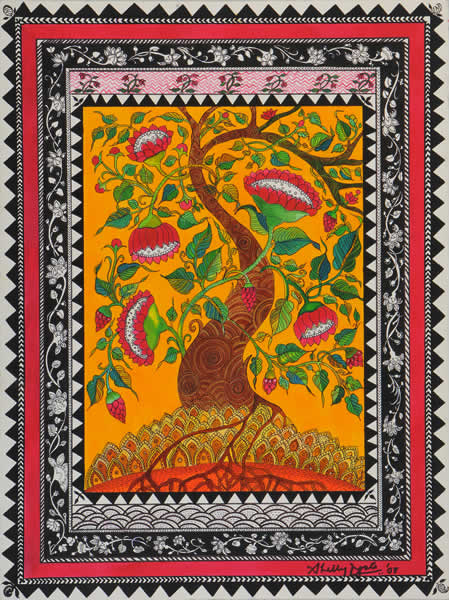 Mithila art is filled with symbols of fertility and prosperity like the fish, elephant, sun, moon, bamboo plant and lotus .The colours are extracted from vegetable pigments and are bright and cheerful – green from leaves, yellow from turmeric, red and pink from beetroots and orange from marigolds. 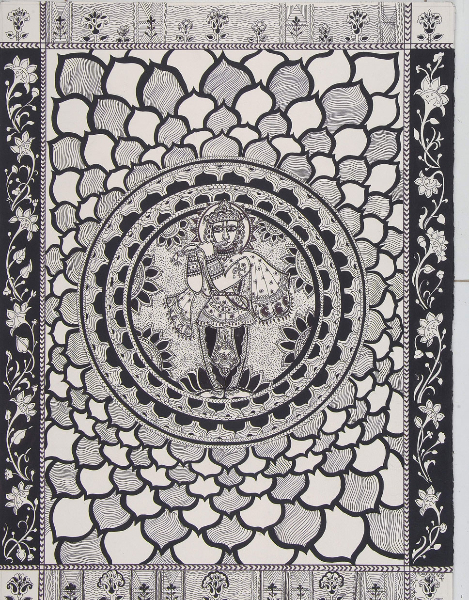 Shelly is particularly attracted to the vivid colours and strong line work in Mithila art. 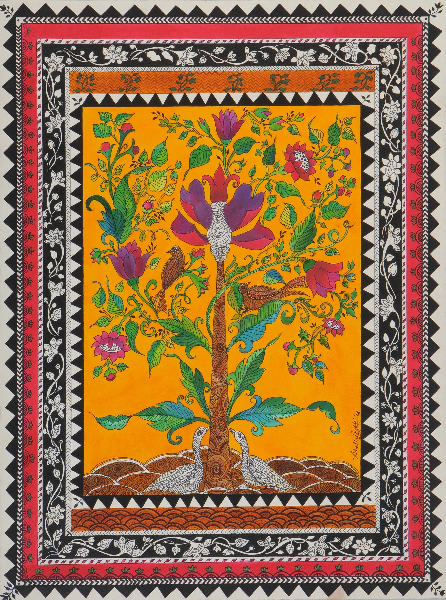 While aspects of Mithila tradition is drawn upon in this decorative series, Shelly’s paintings have been reinvented and augmented in a way to create works that are exuberant, intricate, well put together and very exemplary of 21st century India. 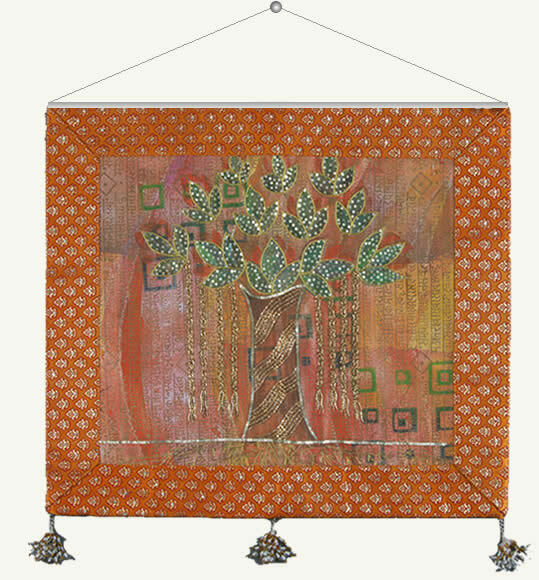 Shelly has not only taken elements of Mithila paintings, she has also taken inspiration from diverse decorative traditions of India and beyond. 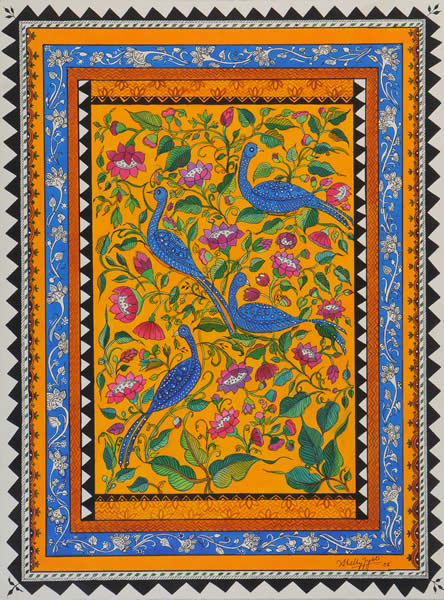 These include “zardosi” from Persia brought by the Moguls, “kantha” from Bengal, and different Chinese embroideries. All of this is creatively resurrected and fused by Shelly who is guided by form, agnostic of source, forging her own brand of heterogeneous and ornamental paintings that are truly beautiful in the classic sense of the word. 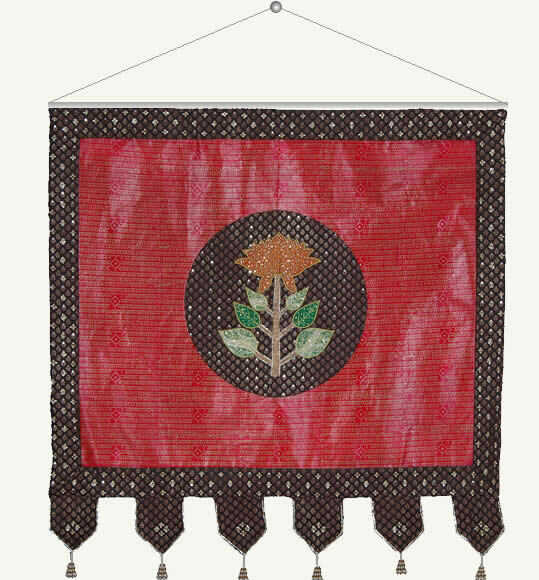 For Shelly, “Beyond Mithila – Exploring the decorative ” is all about a spiritual experience in the 21st century of the art that belonged to the 7th century. Come, see this exquisite collection. Show opens Friday 3rd October 08, 6.30 pm onwards. Apollo Bunder, Mumbai 400 039.